Flinnt is a FREE communication & sharing platform designed for Educational Institutions. The high degree of control along with the academic structure makes Flinnt the preferred choice of educational institutions. 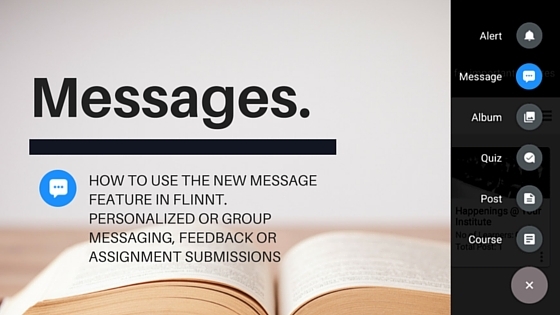 Recently Flinnt has added a new feature “messages” which helps teachers to message individual students or a group of students. Teachers can use messages to send attendance data, assessment results or any other information that is to be shared with a specific student. It can also be used to share notes or worksheets with an individual or a group of students (A). Messages are a great way to share group projects, all the students who are marked into the message can keep commenting till the end of the project. Over and above this message can also be used by the teachers to assign assignments to students, where students can send back their work in a digital form individually to the teacher. By default messages from students are disabled, teachers can enable (B) it for the duration of the submission. A teacher can post the assignment to the group and can specify the duration for which messaging will be permitted and instruct the students to send in their assignments during the submission window. In addition to text in the message, teacher or students can also exchange audio, image, doc or video files (C) as a part of the assignment or submission. Teachers can schedule the message as per their convenience, the teacher can draft the message and schedule it to be sent after school hours. Teachers can also pause comments anytime during the interaction by disabling the comment or disabling messaging itself. This way, teachers won’t have to worried about receiving notifications and comments when they don’t feel the need for it. Thus message is an excellent online tool which can be used for regular communication and it can also be used for assignment submission and differentiated learning for an individual or a group of students. ← Indian Internet user base touches 402 Mn and educational institutions are set to benefit.